A case of dog paralysis and disc injury has one visitor searching for more answers. My dog is a 13-year-old Chihuahua mix that I rescued from a shelter three years ago. He recently had trouble walking and yelped. We took him to the vet, and he did X-rays. The vet put my dog on steroid medrol for 36 hours because he thought my dog might have a herniated disc, but the medication didn't seem to help. I took my dog home after three days. So far, he cannot walk, although he's been doing better in the past two days, and gaining a little more movement. Any suggestions? Can you tell me exactly which procedure your vet did to diagnose the spinal problem? 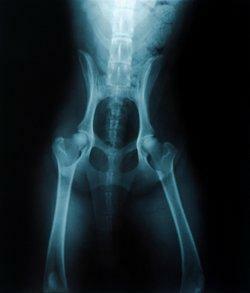 A regular X-ray will not show your dog's discs or spinal cord, just the vertebrae. A myelogram may be needed to see the source of your dog's paralysis. This procedure involves injecting dye into the spinal cord to make it show up in the X-ray. Any break in the outline of dye around the cord indicates a pressure point caused by a disc rupture. Your vet can use this procedure to pinpoint a rupture if one exists, but the test may also help your vet determine if another type of spinal injury or disease is the cause of the problem. Sometimes a disc rupture will heal on it's own, and I believe that is what your vet is hoping for. The steroids will remain in your dog's system for a while, and they should help reduce any swelling. This in turn should lead to more mobility. I think this is what you're already beginning to see in your dog, although recovery will be slow. I recommend that you take every precaution to keep your dog calm and comfortable so he doesn't reinjure himself. Keep his food and water bowl close by, and try to avoid letting your dog walk on stairs if you can help it. This presents a greater opportunity for spinal instability that could lead to more pinching of the injured disc. If you notice your dog take another down turn in mobility, contact your vet right away. Thank you for your question, and I hope your dog is feeling more like his normal self very soon.